The Masters Final this year is going to take place in two cities: first leg in Sao Paulo, Brazil - from September the 24th to the 29th, and second leg in Bilbao, Spain - from October the 8th to the 13th. The list of participants is stunning: GM Magnus Carlsen, number one player in the world; GM Levon Aronian, number two; GM Vishy Anand, World Chess Champion; GM Serjey Karjakin, the super-strong Russian; GM Fabiano "the fab" Caruana from Italy and the strong Spanish player GM Francisco Vallejo Pons. It'll be a clash of Titans! Games for the first leg start at 02:00pm ICC time (EDT); games for the second leg start at 10:30am ICC time (EDT). Rest days are September the 27th and October the 11th. ICC Chess.FM will be on the air with all the team, and some BIG surprise! We will have the usual online TRIVIAs, where ICC members can win free time on their account, and the Game Of the Day service, with the big TRIVIA prize: every day a lucky ICC member can win a 1-year subscription for the best chess magazine out there: New in Chess! 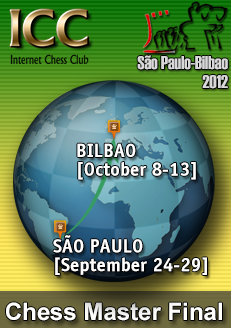 The Masters Final first leg is over, and the players are now moving on to Europe, to play the second leg in Bilbao, Spain. The first 5 rounds have seen a stellar Fabiano "the Fab" Caruana play amazing chess, to win three games and draw two. Fab Fabiano beat Numero Uno Magnus Carlsen in the first round, setting the whole tournament to be one of the most interesting ones in the last years. It's not frequent to see Magnus lose a game! Then The American Italian young stud went on to beat another uber-strong youngster: Sergey Karjakin, and only the World Champion Vishy Anand was able to stop Caruana's solitary race in round 3, with a draw. In round 4 Caruana ran over Francisco Vallejo Pons; only in the 5th and last round for this first leg Fabiano found himself in serious trouble against Levon Aronian, and only Aronian's imprecise play in the ending and some luck allowed Caruana to avoid the first loss in the tournament. In the Live Rating List Caruana is now number 5 in the World, with a monster rating of 2785.7! We'll see if the young Brazitalian star will be able to also become a young Spanitalian star! GM Magnus Carlsen wins the 2012 Grand Slam by defeating GM Fabiano Caruana in the playoffs (2-0).